When I first saw the oversized rafts and the seating, I actually wondered if the rider even would get very wet on the slide. Very shortly into the ride, I got my answer when I went down the first drop and a wave of water gushed over me. This is repeated several times over the course of the ride. The ride is a lot of fun, although it doesn’t give quite as much of a sense of speed as I had been expecting on a slide of that length. The view from the ride is pretty spectacular at times, although you are going too fast to appreciate it for long. The ride is quite smooth. My wife didn’t opt to ride it that afternoon, but did ride later in the week and she said it was no problem for her. After my ride, I re-joined my family at the Mickey pool for a while. One nice thing about the design of the pools and the overall environment of the cruise ship, was that we were able to give my son a bit more freedom than we have in the past. While I was on the ride, my wife had even felt comfortable with briefly leaving my son at the pool while she went to the restroom. On another visit to the pools later in the trip, we all found ourselves scattering to different parts of the pool areas, with only occasional check-ins to make sure we always knew where our son was. After we finished at the pools, we got back to the stateroom with enough time for each of us to shower and change clothes before it was time for the mandatory safety drill. Every cruise ship is legally required to have a drill shortly before departure to make sure that all the passengers are aware of the emergency procedures and the location of their designated gathering location. The emergency gathering location is assigned based on the location of the stateroom and ours was inside of the Buena Vista Theater, the ship’s movie theater located on deck 5. This was kind of a nice location for it as it is indoors and we could sit in comfortable theater seats during the drill. I joked to my wife that they should have set the mood appropriately by showing Titanic or The Poseidon Adventure in the theater during the drill. In the past, guests were required to don life vests before leaving the stateroom for the drill, but this is no longer required. As guests arrived at the theater, crew members did their best to check off each stateroom number. Guests were arriving too quickly for the crew members to keep up very well, though, so eventually they took to the stage and called out the stateroom numbers that had not yet been checked off. The crew members also gave a short talk on how the emergency procedures worked and also demonstrated how to properly don and use a life vest. All of this took about 20 minutes or so at the most, after which an announcement was made that the drill was over and everyone was free to resume the fun. 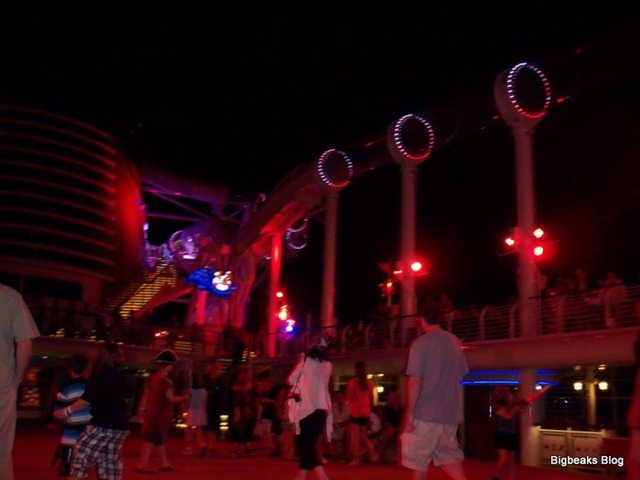 After the safety drill, we headed to the upper deck for the sail away party and to watch the ship’s departure. 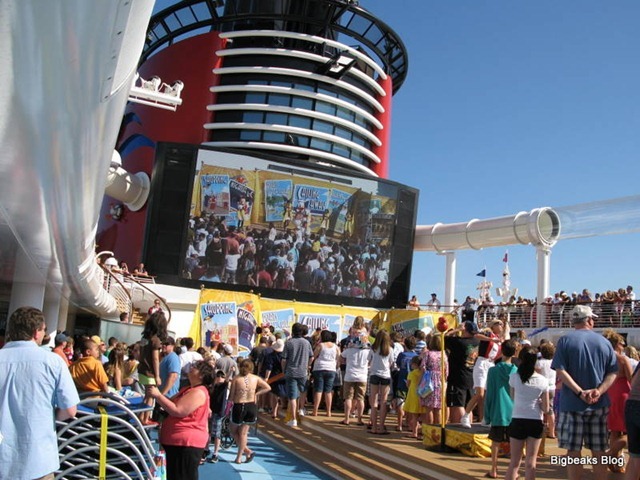 The sail away party is basically a dance party where they play fairly current, family-friendly pop music while Disney characters dance around on a stage. We watched for a few minutes and actually found that wasn’t of much interest to us, so we instead got some drinks from the soft drink station and then found a table with an ocean view and sat down to watch the departure. We could still hear the sail away party just fine from where we were, including a short welcome speech by the ship’s captain that was then followed by a countdown to the ship’s departure time. When the countdown reached zero, the ship’s horn played “A Dream Is a Wish Your Heart Makes”. The horn on the Disney Dream plays a number of different Disney tunes, although this one and “It’s a Small World” were the only two that we heard on our trip. Obviously, the ship was supposed to pull away from the port at the end of the countdown, but it didn’t actually happen. We could see that a Carnival Cruise Line ship was making its way out of the port at that same time and my guess is that ship was delayed for some reason and we couldn’t pull out until after it had cleared the area. We didn’t actually start moving until about 15 minutes or so after the scheduled departure time (and the end of the countdown). It actually took a minute or two for us to realize the ship was moving as we really couldn’t feel the motion at all. 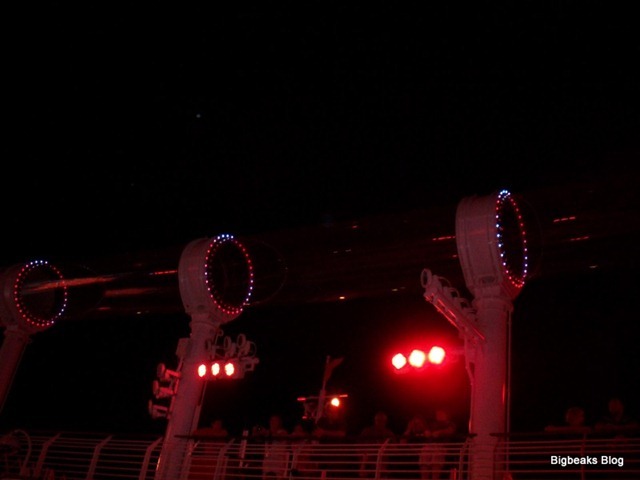 On both of our previous cruises, the rocking of the ship was very noticeable pretty much whenever it was in motion. Fortunately, none of us are prone to seasickness, but it did take a bit of time to find our sea legs on those trips. On the Dream, I never really felt the motion at all. I don’t know if this was a result of the larger ship or if it was due to the time of year, but the entire cruise was exceptionally smooth.